Adjust your primary desktop screen resolution to 1024x768. From the File menu, select New Demo. In the Computer box, type in the machine name or IP address of the machine you want to connect to. Drag the Remote Desktop Size slider all the way to the right, until it says “Full Screen”. Log in to your Remote Desktop session. Unpin the yellow Remote Desktop bar at the top of the display, so it does not show up during your demo capture. 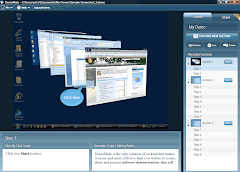 Minimize the Remote Desktop session, and return to the DemoMate client. Click the Capture New Section button. For your first click, select the Remote Desktop session on your taskbar. This will maximize the Remote Desktop again. Proceed to capture your demo as normal, and press ESC when you are done capturing. After your entire demo is captured, close the Remote Desktop session and return your primary desktop to its normal resolution. Remove any captured steps from sections that involve maximizing the Remote Desktop connection window, since that isn’t a desired step in the demo.